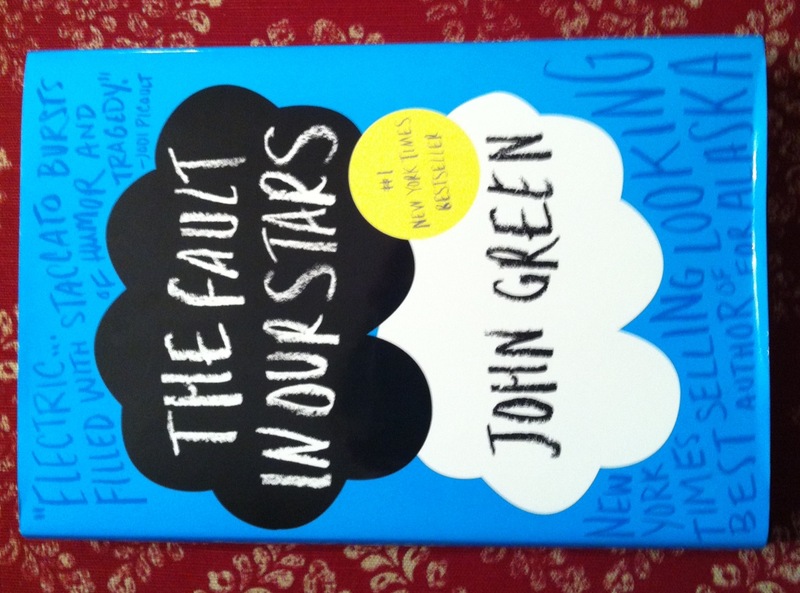 Recently, I read The Fault in Our Stars by John Green. I didn’t even read the jacket, so I had no idea what I was getting myself into. Do you ever do that? Truthfully, the cover is so eye catching I probably would have picked it up anyway though. Don’t you just love that vibrant blue? This was another internet find, see. Pinterest or Tumblr…(I can’t remember which now) introduced me to this author. He and his brother Hank Green have a YouTube channel, VlogBrothers and someone made a meme about “the Venn diagram of boys who are stupid and boys you don’t want to date is a circle”. Here is the link to the whole video. I loved it, and I completely agree! Down the rabbit hole I went trying to find out more about this guy. Not only do they have the VlogBrothers, there’s the Nerdfighters and all this other stuff too. Here’s a video explaining How to Be A Nerdfighter: A VlogBrothers FAQ. Somewhere along the way I became distracted. (You know the dog in the movie Up? Some days my friends say I’m a bit….Squirrel!) There was a comment I read about this amazing book The Fault in Our Stars. Whoa, this guy’s a writer? Then I got distracted by something shiny. I put the book on my to-buy list. That was not the last mention of The Fault in Our Stars I would come across. Everyone has a list of books to pick up next time they’re out, right? Like a grocery list, but to feed the mind. After a girls night dinner, I got conned into going to the book store. Okay, fine, she didn’t so much con me as mention she was going to the book store and I may have begged to go along….just a little bit. She picked up a book to read on her vacation and I got The Fault in Our Stars. This did not sit in my to-read pile for long. It was like the bright blue cover was calling to me, so I took it with me to start while I visited my best friend for her birthday. These characters….I mean, wow, they’re great, so well written, and REAL. I just loved Hazel to pieces! Don’t even get me started on Augustus or Isaac. They broke my heart and mended it all at once. Hazel is so…. It is like trying to describe your best friend or your sister. Every time I think of her, I get a clear picture of her as a person, but feel I lack the ability to accurately describe her. Even if I tried, I couldn’t do her justice. I would surely leave out a vital piece of her. You simply must meet Hazel. These are teenagers that are funny, sarcastic and irreverent. They have the same tone that I hear when my 15-year-old niece speaks (the one that makes me want to laugh and roll my eyes all at once), and they are intelligent, fiercely intelligent. It is all tempered with this maturity and an awareness of others that is far beyond their years, which is completely understandable due to the circumstances. Their stories are told with truth, humor and grace. This entry was posted on Wednesday, June 5th, 2013 at 8:42 pm	and tagged with Augustus, Book Reviews, books, faultinourstars, Hank Green, Hazel, John Green, Nerdfighter, read, VlogBrothers, Young-adult fiction You can follow any responses to this entry through the RSS 2.0 feed.